EMCS Limited (“EMCS”)*/** was established in 2001 from a Marine Consultancy background to fill an obvious need in the marine industry for highly skilled, efficient, cost-effective and properly supervised Riding Teams. The business quickly expanded to also provide onshore Shipyard Services to include docking, ship repair and workshop support. Diving Services was the latest step forward when EMCS Diving Support Limited was established in 2003 (now incorporated into EMCS International Limited). We can now provide diving services anywhere in the world and at very short notice for propeller polishing, hull cleaning, hull inspections (owners request, pre-purchase, class inspections to any IACS Class), damage inspection and repair etc. In 2004, Sesmarine (Isle of Man) Limited** was integrated into the EMCS Group to further our global reach and candidate database. We have further developed our areas of expertise with the provision of teams (IAC Classification Society approved) to carry out on board Ultra-Sonic Gauging (UTM) works. In 2007 we commenced with the provision of Indonesian riding teams for ballast tank , deck and any other cosmetic works in service. 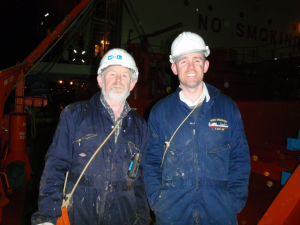 EMCS has since 2006 ran the Ship Superintendents’ Training Course, based on the Isle of Man. This highly successful course has welcomed delegates from all over the world and from all aspects of the marine industry. The diversity of backgrounds and specialisations in attendance continues to widen with recent participation from delegates looking after offshore supply/service, ferries, cruise ships, LNG/LPG, heavy lift, tanker, container, bulk, reefer, yacht/superyacht type vessels. As of April 2009 EMCS and Sesmarine are the trading names of EMCS International Limited (Incorporated in the Isle of Man – Company Number 123237C). In February 2010 EMCS (Europe) Limited was established to look after EMCS shipyard labour supply business in Europe. From 1st January 2014, the Workshop, Repair and Agency Services of The Ramsey Steamship Company became Ramsey Shipping Services Limited (managed by EMCS International Limited). EMCS have continued to grow our client base and reputation in the maritime industry and have been, and will continue to be, a proven global market leader in the provision of marine personnel. *Originally “Erin Marine Consultancy Services”. **As of April 2009 EMCS and Sesmarine are the trading names of EMCS International Limited (Incorporated in the Isle of Man – Company Number 123237C).